This page Socialism is part of the politics series. Socialism refers to a broad array of doctrines or political movements that envisage a socio-economic system in which property and the distribution of wealth are subject to control by the "community." The modern socialist movement had its origin largely in the working class movement of the late-19th century. In this period, the term "socialism" was first used in connection with European social critics who criticized capitalism and private property. For Karl Marx, who helped establish and define the modern socialist movement, socialism implied the abolition of money, markets, capital, and labor as a commodity. The history of socialism has its origins in the French Revolution of 1789 and the changes which it wrought, although it has precedents in earlier movements and ideas. The Communist Manifesto was written by Karl Marx and Friedrich Engels in 1848 just before the Revolutions of 1848 swept Europe, expressing what they termed "scientific socialism". In the last third of the 19th century, Social Democratic parties arose in Europe, drawing mainly from Marxism. The Australian Labor Party was the world's first elected socialist party when the party won the 1899 Queensland state election. In the first half of the twentieth century, the Soviet Union and the Communist parties of the Third International around the world mainly came to represent socialism in terms of the Soviet model of economic development, the creation of centrally planned economies directed by a state that owns all the means of production, although other trends condemned what they saw as the lack of democracy. In the United Kingdom, Herbert Morrison said that "socialism is what the Labour government does" whereas Aneurin Bevan argued that socialism requires that the "main streams of economic activity are brought under public direction", with an economic plan and workers' democracy. 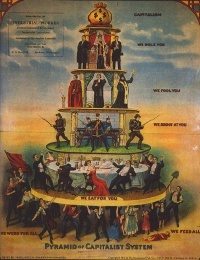 Some argued that capitalism had been abolished. Socialist governments established the mixed economy with partial nationalisations and social welfare. By 1968, the prolonged Vietnam War (1959–1975) gave rise to the New Left, socialists who tended to be critical of the Soviet Union and social democracy. Anarcho-syndicalists and some elements of the New Left and others favored decentralized collective ownership in the form of cooperatives or workers' councils. At the turn of the 21st century in Latin America, Venezuelan President Hugo Chávez championed what he termed socialism of the 21st century, which included a policy of nationalisation of national assets such as oil, anti-imperialism and termed himself a Trotskyist supporting permanent revolution. Unless indicated otherwise, the text in this article is either based on Wikipedia article "Socialism" or another language Wikipedia page thereof used under the terms of the GNU Free Documentation License; or on original research by Jahsonic and friends. See Art and Popular Culture's copyright notice. This page was last modified 21:00, 14 March 2019. This page has been accessed 7,025 times.